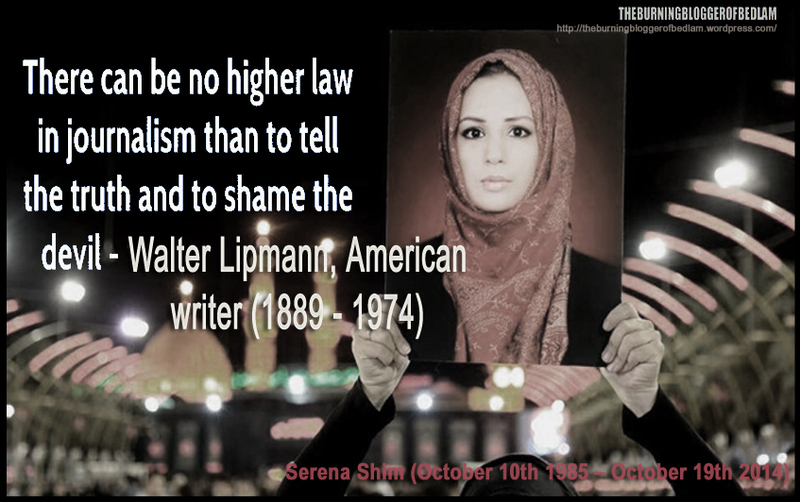 Homethe Suruc Massacre and the Turkish Deep State. the Suruc Massacre and the Turkish Deep State. Aftermath of the Suruc massacre of July 20th, 2015. The Suruc Massacre and the Turkish Deep State(s). 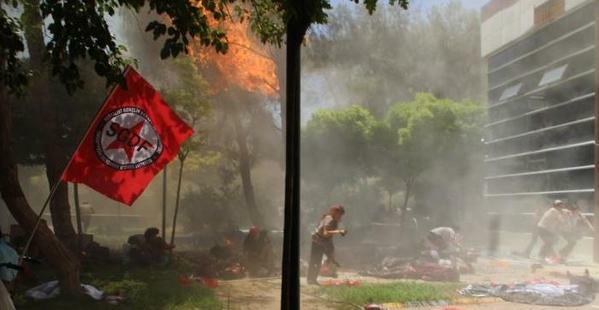 The Suruc (pronounced Surosh) massacre of July 20th saw 32 people killed and more than 100 wounded when a meeting of the Kurdish youth group the Socialist Party of the Oppressed was attacked with an explosive device in the town 10 kilometres from the Syrian border. At face value, the Suruc attack seemed like a pretty typical IS terror operation in revenge for the defeat in Kobani and the other defeats in Northern Syria at the hands of the Kurdish YPG group and the US Air force. It was only weeks ago that the IS group sent scores of fighters across the Turkish border into Kobani where they massacred hundreds of people before being killed. 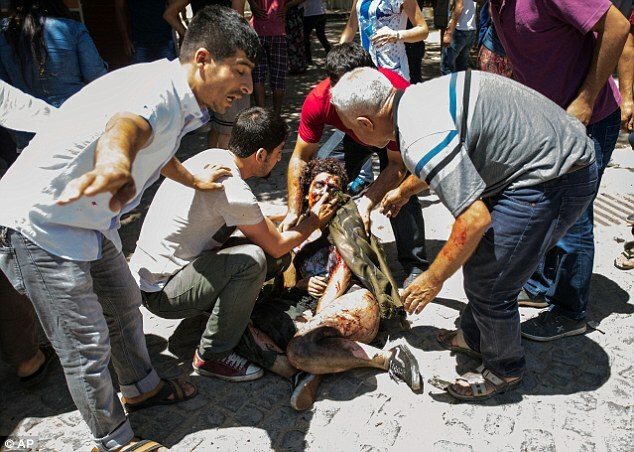 Only three days before Suruc, ISIL had sent a truck bomb against civilians celebrating the Eid festival for the end of Ramadan in the Iraq town of Khan Bani Saad killing at least 115 people. Analysis of the Suruc attack indicates that the event appears to have been a false flag attack conducted by the Turkish state or another “third force” that has infiltrated the Turkish state. ISIL appear not to have had any involvement and the attack was not conducted by a suicide bomber. 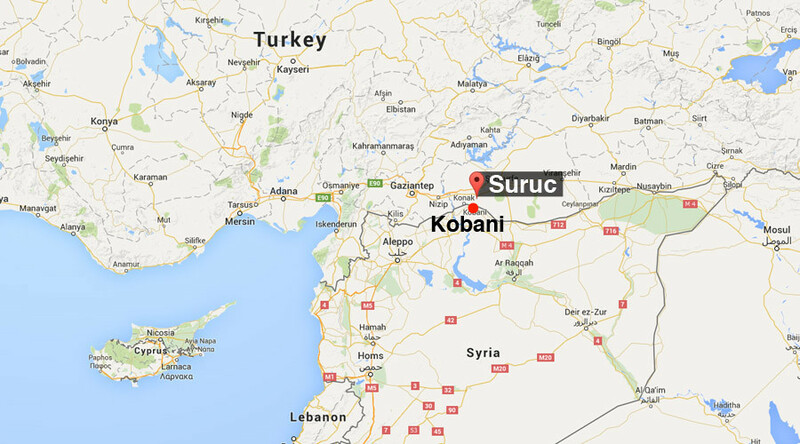 Suruc is shown just to the north of Kobani and the Syrian border. Turkey , a large and strategically located state has been a NATO member since 1952 and is a key long term US Middle Eastern ally. NATO’s “stay behind” Gladio armies wreaked more carnage upon Turkey than any of their other (Western European) targets during the Cold war. There have been huge tensions in South Eastern Turkey since the battle of Kobani late last year and in recent weeks the Turkish Government has been threatening to send 20,000 troops into Northern Syria in order to carve out a “buffer zone.” for refugees. The manoeuvring seems to have been inspired by increasing Turkish disquiet about the mounting victories of Kurdish fighters backed by US Aircraft in Northern Iraq. It is worth noting that although at face value the PKK and Turkey are the most bitter of enemies, like Hamas, the IRA and many other groups, the PKK received key support from their supposed enemy Turkey on many occasions. On July 12th, the Kurdistan Workers Party (PKK) announced an end to it’s two year ceasefire with the Turkish Government. There is no doubt that Turkey has been THE key base for the IS operation in Syria. Maps of the area controlled by the group in Syria shows little more than a straight line from the Turkish border through to Raqqa (the IS Syria “capital” down to Deir az Zour on the border with Iraq. It emerged earlier this year that in one case a Turkish officer had a gun shoved in his face by an agent of the Turkish National Intelligence when he attempted to stop a truck sending supplies to ISIL . Assistance has undoubtedly been provided by many states but in the case of Turkey you need only look at the map to understand the central role Turkey has played in the rise of the group. 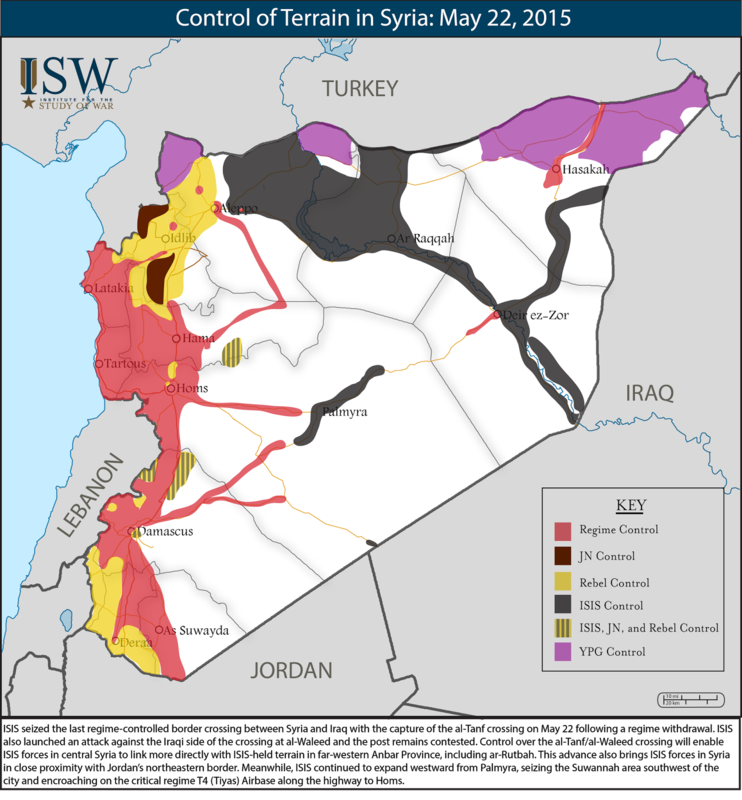 ISIL in Syria- a straight line down from Turkey to Deir az Zour on the Iraq border. Map represents control as of May 22nd, 2015.. The Turkish Government Account of the Suruc Attack. Initially the Turkish government suggested to their media that the attack may have been conducted by a female suicide bomber. There seems a logical explanation for this, if you look at before and after images of the scene of the blast, it can be clearly seen that there are a large number of young women in the crowd near the epicenter of the blast. The female bomber hypothesis probably arose from the initial assumption that it was a suicide attack and that the most severely damaged corpse would be that of the bomber as is generally the case, for obvious reasons. The most severely damaged corpse was that of the young woman at the front near the epicenter of the blast. There was no suicide bomber so the closest victim was initially mistaken for the attacker. Several days later the Turkish authorities claimed that they had identified the bomber as a man named Seyh Abdurrahman Alagoz, a Kurdish native of Adiyaman province. No evidence connecting this individual with either the ISIL group or the Suruc attack was provided. 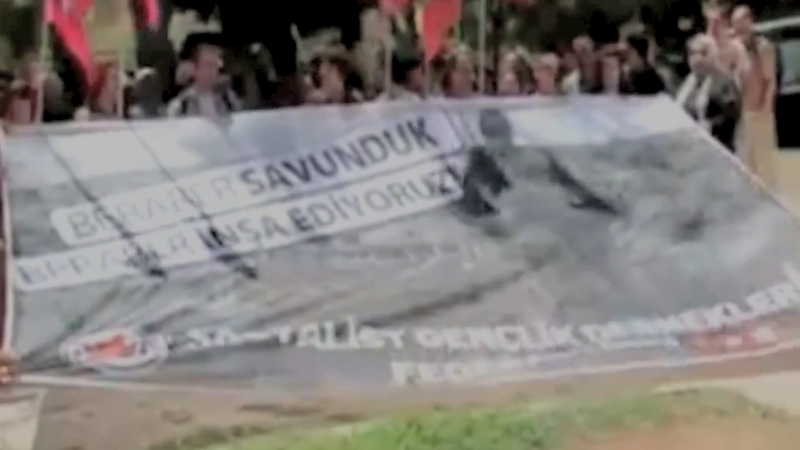 The scene in Suruc immediately prior to the attack. The video of the attack does not show any sign of an attacker entering the area at all. Three seconds before the attack, a small bang can be heard, it is noticed by the crowd, some of whom seem alarmed. Hen the bomb detonates, it seems to come from the ground near the front of the crowd. A Turkish court has banned publication of the images of the attack and Twitter was briefly blocked in Turkey in the wake of the Suruc attack. It was taken for granted internationally that the IS group conducted the bombing, but the claim of responsibility from the group, generally forthcoming within hours of an attack, did not come for days, and when it arrived it referred to a car bombing. But the Suruc attack was clearly not a car bomb, no-one is claiming that it was- other than “ISIL” via twitter. The claim of responsibility for the Khan Bani Saad massacre of July 17th by contrast, was specific and detailed, with the group claiming to have used a 3 tonne device and also of targeting Shia Muslims. A survivor of the Suruc blast is treated in the aftermath. An article in the Turkish newspaper “Today Zaman” in January this year claimed that elements of the Turkish Government were planning to conduct mass casualty terror attacks in Turkey and blame the attacks on the Fethullah Gulen, an infamous CIA cut out and alleged drug trade facilitator. Today Zaman seems to have pro-Gulen leanings judging from this piece. In December 2014, a Turkish court issued an arrest warrant for Gulen, who has lived in the US for decades. Turkey is understood to be a key hub for the international heroin trade and seems to act as a way station between the source of the opium and Europe. The infamous Susurluk scandal of 1996 erupted after a serious car crash left three people dead and it emerged that amongst them were a police chief, a senior politician, and an international drug dealer and hitman. Devastatingly it emerged that a number of infamous figures in the drug game were being given Turkish Diplomatic credentials with which to operate. A series of cascading events have taken place since the Suruc attack that now see the Turkish Military in action in Northern Syria in a big way for the first time in the four year Syrian Civil War. There have been demonstrations in several areas of Southern Turkey and in the largest city Istanbul. . The PKK claim to have killed two Turkish police in retaliation for their collaboration with ISIL. The PKK also lured an apparent IS sympathiser into an ambush and murdered him in Istanbul. Another police officer was killed by masked men in Diyarbakir. The apparent “usual suspects” of both ISIL and the PKK were rounded up in a series of massive police raids that saw more than two hundred arrested. The Western media claimed that ISIL were the target but it is claimed by Kurdish activists that this was mask for a crackdown on the PKK. Turkish forces are now engaged in the Syrian War and are claiming that they are going to target both ISIL and the PKK/YPG in Northern Syria in an ongoing operation. 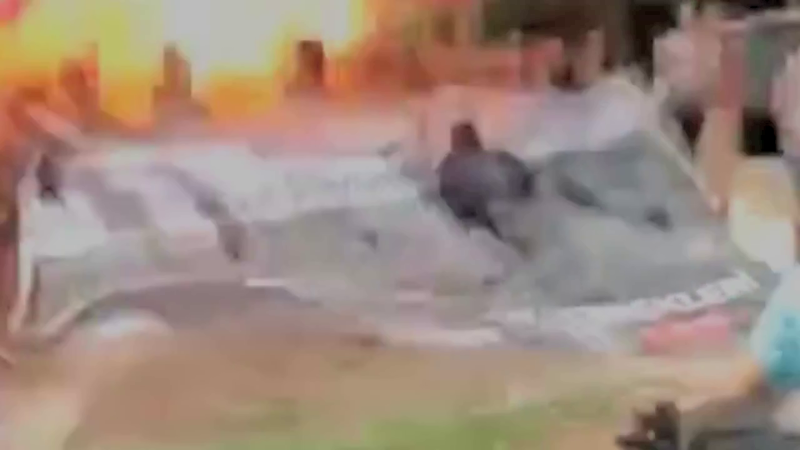 There are no ground forces involved at this time. So it seems that Turkey has decided that it is time to “cash in” the IS group for an extended incursion into Syria where they will be attacking the YPG, the US’s only real ally in Northern Syria. Turkey is apparently testing the waters at this stage but the intent is clear and both the Suruc attack and the supposed gun-battle with the IS group at the border were part of the same Black Operation with the aim of curtailing the PKK influence in Northern Syria using the IS as a convenient mask. That’s why this seems to have happened and elements of the Turkish Government now seem to be tacitly admitting that the Suruc attack was a false flag and as per the Today Zaman piece from January, they are trying to lay the blame upon the Gulen organisation, the “next in line” CIA front Turkish Government. The Istanbul bombings of November 2003 that saw 70 people killed in four attacks that targeted the British Consul, a branch of (infamous alleged money launderer) HSBC bank and a Synagogue. In 2010 it emerged that three Turkish Generals had collaborated with al Qaeda in the attack that was part of a failed coup plot known as Operation Sledgehammer. The combination of the evidence regarding the Suruc attack points to the fact that whereas the 2003 bombing massacres were a collaborative effort, the Suruc massacre was conducted vy the Turkish “deep state’ or Shadow government and the ISIL group did not perpetrate the Suruc massacre. The Details of the Attack. The device appears to be emplaced, no-one appears to enter the area of the attack prior to the attack. The claim of responsibility was late and inaccurate and is essentially meaningless. The Turkish Government felt a need clearly to initiate further military involvement in Syria and this event combined with a presumably fabricated border clash several days later have seen them at least partially achieve their goal. The continual victories of the YPG with US air support , which is simply the PKK re-badged, were intolerable to Turkey and so they acted. Within Turkey there does seem to be an understanding that this attack was at the very least facilitated by elements of the Turkish state. Beyond the dubious PKK targeting of supposed ISIL collaborator police in revenge and the cynical murder of a former ISIL fighter in Istanbul apparently working as a soap salesman. A senior Turkish police official has now accused the Gulen group of complicity in the attack, as the Today Zaman January article claimed would happen. Determining which faction of the Turkish deep State were involved may be extremely difficult as the Gyulen people blame the Government. The positive thing is that at least in Turkey people know that there is a “parallel state operation involved. The Real Danger of ISIL Exposed. Due to the extensive support they receive from many nations, the IS group represent a real threat to the people of Syria and Iraq. Outside the zones of combat, it is the ISIL brand rather than the actual group that is the threat. While they exist, anyone can blow up or shoot up anything anywhere and say it was an ISIL attack. The group’s rhetoric track record of atrocities both real and fictitious is such that few will question them being blamed for almost anything. ← Westminster Child Abuse: High Level Child Abuse Ring Exposed. Thanks very much for those kind words Danny. It means a lot.